(Venice, Italy) Ah, Venetian masks. If you live in Venice for awhile, you can understand why they evolved. It is impossible to go anywhere without running into someone you know, and sometimes you long to be anonymous, just for a moment. I've known Sergio Boldrin for many years. Long ago, before I moved to Venice, I had bought one of his masks, a magical Sun, after stumbling on his tiny shop at the foot of the Rialto Bridge on the San Polo side. The mask was the focal point of the wall in my living room in Los Angeles for many years (where it probably still hangs unless my ex-husband has finally decided to redesign the room:). To me, Sergio is a gatekeeper. He can open the door and offer a peek into a certain level of the Magic Kingdom called Venice. perks come with effort, you know! As we all know, nothing comes for free in this life -- there is always a price to pay. Sergio is such a good friend of mine that he is one of the people mentioned in the dedication of the new Knopf edition of Harley, Like a Person. We have decided to create a little game for you to play, so you can have a perk, too -- but you must make an effort first. He has agreed to give you a discount if you read this article, go to his shop and then answer a question -- a little Venetian quiz. My logo, Venetian Cat, was designed by a young Venetian artist. She has the head of a woman and the body of a lion, like the Sphinx -- also known for asking a question or two. In my version, the open book (which means Venice is at peace) says, Immagina (Imagine), instead of the traditional Pax tibi Marce Evangelista meus (Peace be with you, Mark, my Evangelist). Since Venice is seeking to attract more educated tourists, I'll try to do my bit and give a few details about what you are buying. Together we can imagine a magical Venice, mixing a dash of the glory of the past together with the present reality. In a city where there seems to be a mask shop on every corner, it may be surprising to learn that the ancient Venetian craft of mask making was only revived about thirty years ago. 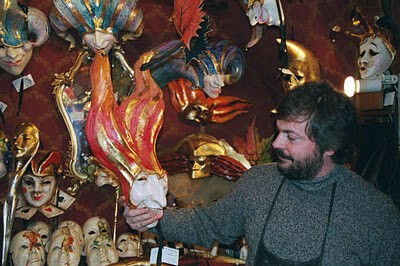 Sergio Boldrin is one of the senior maskmakers in Venice, as well as an accomplished artist. When he was a child, there were no mask shops in the entire city. There was no Carnival. During the terrorism and political upheavals in Italy in the 1970s, the wearing of masks was discouraged. Masks disappeared, along with Carnival, when Napoleon's troops brought an end to the Venetian Republic in 1797. Since then, they've resurfaced and submerged again throughout the decades until being vanquished to the pages of the history books by the 20th century. However, they staged a spectacular comeback in the late 1970s and early 1980s when a group of young people, including Sergio, brought them once again into the forefront. 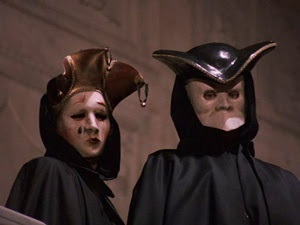 As far back as the 11th century, the mattaccino costume was worn by mischievous young men, who, dressed as clowns, would bombard noblewomen with eggs filled with rosewater, inspiring the first official documentation regarding masks: a 1268 law prohibiting the throwing of eggs while disguised. (Note from Cat -- ah, the good old days! No Dressi ng Up As Clowns and Throwing Rosewater Eggs at the Noblewomen by Order of the Senate.) The Venetian government apparently gave up trying to enforce it, however, and resorted to putting up nets along the Procuratie in St. Mark's Square to protect the ladies and their rich clothing. Even in Sergio's day, young Venetian men opened fire on expensively-dressed women with the yolky bombs. "I did throw an egg or two myself as a kid," confessed Sergio. "Venetian boys have been throwing eggs for more than 700 years." Mask-making in Venice can be documented back to the 13th century, though it probably existed much earlier. On April 10, 1436, the ancient profession of mascareri was founded under the jurisdiction of the Painter's Guild. Over the years, masks were used for a variety of reasons -- in the government, the theater, and as a means of disguise. Masks provided the Venetians a degree of anonymity. The wearing of a mask put everyone on the same level: rich and poor, nobleman and citizen, beautiful and ordinary, old and young. It permitted confidences to be exchanged anonymously -- everything from accusations before State Inquisitors, to a potpourri of sexual indiscretions. Prostitutes practiced their trade without fear of retribution; homosexuals hid their illicit lifestyle. In 1458, it was decreed that men were forbidden to dress up as women and enter convents to commit indecent acts. Not all masks were used for indelicacies, however. The bauta was worn by both men and women, and was not considered a costume but a form of dress -- required wearing if a woman wanted to go to the theater. Il medico della peste had a long beak-like nose stuffed with disinfectants, and, as its name implies, was used to protect doctors from the plague. Another ingredient in this colorful mix was the Italian theater, Commedia dell'arte. 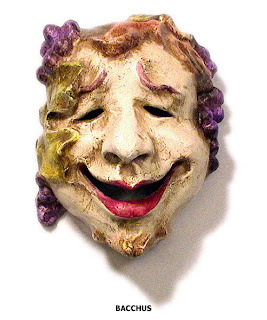 In the 18th century, the renowned Venetian playwright, Carlo Goldoni, brought theatrical masks to the forefront. Pantalone, Harlequin, Colombina and Pulcinella were among the many masks that found their way into the Carnival. Over the years, Carnival festivities grew more decadent until it evolved into a 250-day event of non-stop parties, gambling and dancing. (NOTE FROM CAT: And you think things have gotten out of hand today?! Okay, there is your question: How many days did Carnevale last at its heyday? Answer: 250.) Social and class distinctions were flipped on their heads, with servants dressing up as masters and vice versa. It was difficult to distinguish a housewife wearing a traditional mask, cape, hood and three corner hat from a nobleman dressed in the same outfit, allowing both to move freely though the city without fear of recognition. Sergio has been a major force in keeping this early art form alive. Together with his brother, Massismo, he owns La Bottega dei Mascareri. The original shop at the foot of the Rialto Bridge is not much bigger than a closet, and shares a wall with one of the oldest churches in Venice, the 11th century San Giacomo di Rialto. A second, larger shop is located on Calle dei Saoneri at San Polo 2720, operated by Massimo Boldrin and Rita Perinello, where there is an opportunity to watch the maskmakers at work. La Bottega's creations are completely handmade the traditional way, from papier-mâché. The Boldrin brother's masks have been featured in Harper's Bazaar, Condé Nast Traveler, Orient Express Magazine, National Georgraphic Traveler, the New York Times, Los Angeles Times, Boston Globe and Vogue, as well as many other internationally respected journals, and in numerous TV shows and films, such as "Eyes Wide Shut." God, I love learning new things. That was a great article, thanks. I told Francesco that I think the TV series the BBC made, "Francesco's Venice" should be required watching on all the flights into Venice. Can you get it on DVD there in the States? 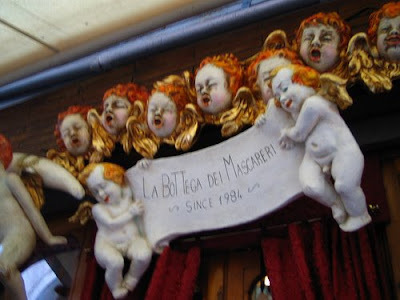 I went to Venice last year and bought as many masks from La Bottega dei Mascareri as I could fit into my suitcase and was wanting to buy some more over the net. Does anyone kow if this is possible? Would like to buy from the shop from the maskmakers themselves, not ebay or importers. I just spoke to Sergio, and he said to please email him at the email address shown above (mascerer@tin.it), or if you want to phone, feel free. Sergio's mask commemorating the fire at La Fenice is above me on the wall as I write this... it is truly one of my most treasured "cose belle da Venezia". We believe he and his brother are among the world's artists. I love this article! I visited Venice for the first time this summer and ran into Sergio's shop by the Rialto bridge. I have to say I love the authentic mask much more than the glittery tourist ones I saw all over. I am hoping to go back to Venice, it is beautiful! Sergio is an authentic human being, which is why he creates authentic masks. Since you are friends with Sergio, could you please ask him where our masks are? We bought them at the bigger shop run by Massimo Boldrin and Rita Perinello. Two years ago we purchased from Serio and then last month we purchased from the other shop. Sergio was great...he was playing an Eagles album the day we purchased. He shipped our masks and we received them in less than two weeks after getting home. However the last purchase from Massimo Boldrin and Rita Perinello hasn't been received yet and we purchased it Oct 19, 2009. It's been almost a month. My friend and I have been emailing the store since last week and haven't received any sort of response back at all. The names are LeeAnn Gates or Kathy Theeler. Any help would be appreciated. Thank you. LeeAnn, Sergio's shop at Rialto is closed right now, as he always is about this time of year. I don't know about Rita and Massimo's schedule, but I just walked past there yesterday, and it was closed, too. The next time I walk past there, I'll ask. But the post office in Venice has been VERY STRANGE lately. Received our masks yesterday! The craftmanship is the best in Venice. Thanks Sergio!! BTW Cat, I have a suggestion for an article. There is a restaurant in Venice that is worth exploring. It is in a bit of a secluded area and doesn't have a sign above the door so you would never know it was there. The owner is awesome and made us feel right at home. His name is Emilio and the restaurant is Taverna del Campiello Remer. The food was delicious (we had the Venetian seafood platter), the service was excellent, and the dining experience was unique--coming from a U.S. perspective. I would highly recommend it to anyone wanting to experience Venetian cuisine. I am glad you got your masks, LeeAnn. What kind were they? Je tente en vain depuis un long moment de joindre le magasin des frères Boldrin à Venise, à la fois par téléphone et par courriels, mais malheureusement sans aucun succès. Je cherche à commander un masque particulier qu'ils sont les seul à fabriquer. Je dispose de photographies numériques de ce masque, que je leur ai adressé en son temps, mais sans suite à ce jour de leur part malheureusement. Je ne peux pas pour des raisons de contraintes familiales me déplacer à Venise et j'aurais besoins des coordonnées bancaires ou d'un équivalent, ainsi que de l'établissement d'une facture, pour finaliser ma commande d'un masque. Pourriez-vous s'il vous plait m'aider ? Merci infiniment par avance pour votre éventuelle réponse. Venetian Cat - thanks so much for this article! I think we stumbled into Sergio's shop on our first visit to Venice a couple of years ago - looked, loved, decided to go a few more blocks, and when we got back, it was closed. We are going back in October, with my 89 year old mom on her first visit to Europe, and will overnight (we're on a cruise) in Venice. Now I know where how to get back to the shop. Is Sergio likely to be there in October? ML, thanks for your kind words. If Sergio himself is not in the shop when you arrive, his brother Massimo will be there -- just don't go at noon because they always eat lunch then. As for the secret question,I don't remember what it is, so I doubt Sergio will:)Just tell Sergio that you read my blog, and that should be good enough. I'll mention it to him the next time I see him. Nice to meet you, Maria. You'd better watch out. I had one of Sergio's masks hanging on my living room wall in LA, and now I live here! The Carabinieri at La Fenice! Callling All Short Film Makers!